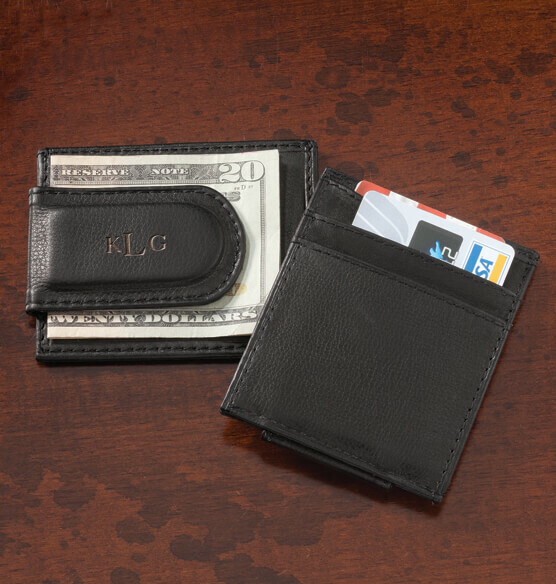 The simple, slim design of this personalized black leather money clip/card holder will appeal to his sense of style. Made from genuine leather in classic black, with three card slots and a super strong magnetic clip to keep contents secure. Add a monogram to make this clip wallet a unique gift idea. My husband is a grab and go kinda guy. He likes the simple things and doesn't want to have to deal with a wallet. He has had the same money clip and card holder for years and its falling apart. this will be great for fathers day and with his new job. Will the middle initial be larger? BEST ANSWER: Thank you for your question. Yes the middle initial will be larger. We hope this information will be of help to you. I am trying to order this item with my husband's initials, but it is unclear what order the letters will appear in. Most sites offer a preview! I need to know if the First, Middle, Last letters will appear in THAT order, or do they refer to the actual initials where the last name initial would be placed in the middle of the monogram. Our last name is actually two words, so my husband doesn't use his actual middle initial; instead, we use the two letters of our last name as our initials, so I need to know what order they will appear on this personalization. JVT is what I want, but if I put the letters in that order, will they come out JTV? BEST ANSWER: Thank you for your question. For the personalization it is personalized in order. For example ABC will be personalized as ABC not ACB. We hope this information will be of help to you.